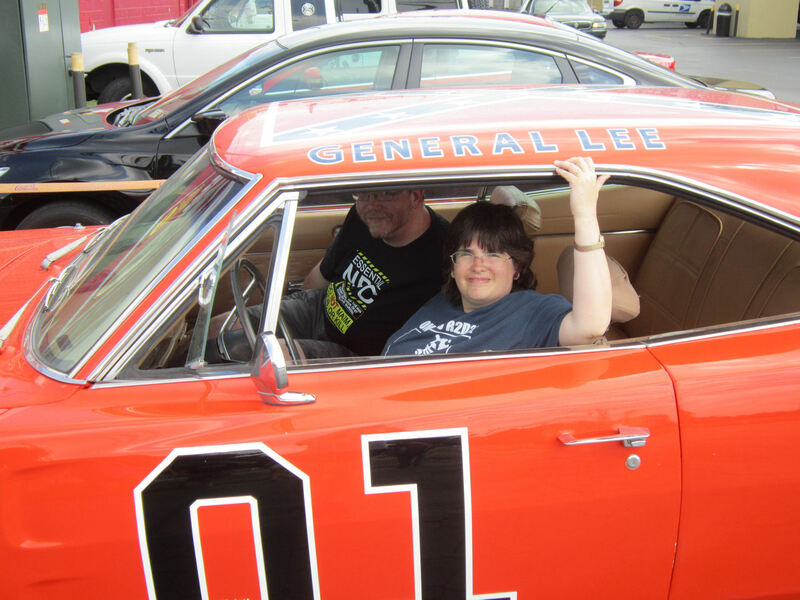 2015 Road Trip Photos #47: The Dukes of Hazzard Confederate History Month Holiday Special « Midlife Crisis Crossover! Back in the ’80s, this vintage merchandise used to make the perfect Christmas gifts, stocking stuffers, birthday presents, and Hannukah surprises. We’d seen a lot of moving, emotionally charged sites throughout our trip through Alabama, Mississippi, and Louisiana — remembrances of Hurricane Katrina, souvenirs from world wars, paths where civil rights protestors once marched, places where people were beaten or died senselessly, tributes to immigrants, signposts of American progress, and new sides to areas we knew only from their embarrassing stereotypes. It was a week we found at turns educational, sobering, revelatory, alarming, grievous, yet uplifting at a number of key points when recounting the victories against racism and oppression wherever we found them. 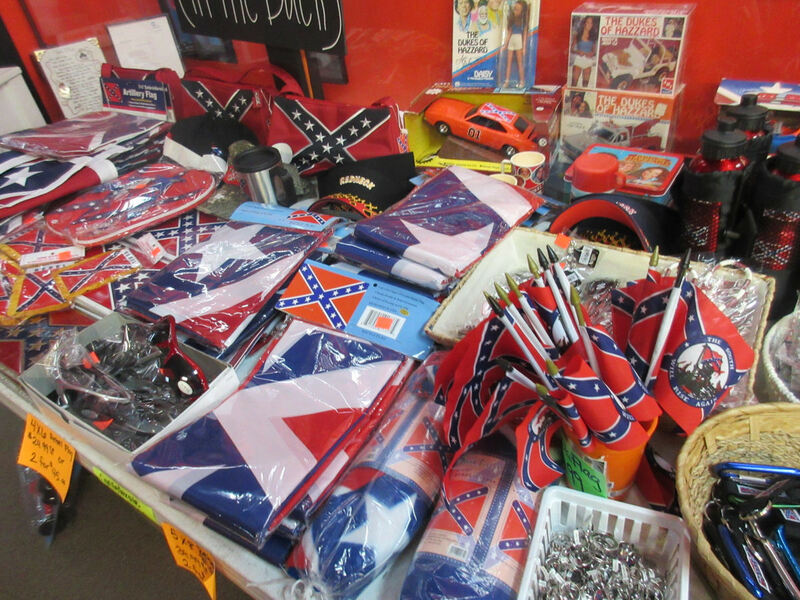 Meanwhile in Nashville, on July 17, 2015, exactly one month after the senseless tragedy at Emanuel AME Church in South Carolina, y’all could still come on down to Cooter’s Place, take a gander through the Dukes of Hazzard Museum, and then head to the backroom and stock up on all the Confederate flag accessories you’ll ever need to celebrate all your favorite Confederate States of America holidays. If you plan ahead, you’ll be all set to celebrate April as Confederate History Month, which is a very real thing in several southern states. Yee-haw! Backstory for youngsters: The Dukes of Hazzard was an ’80s CBS tongue-in-cheek hour-long series about a pair of “good ol’ boys” in constant trouble with the corrupt local government in deeply rural Georgia. Hilarity and car stunts always ensued. It was a show Anne and I watched when we were kids, Friday nights at 8 on CBS, starring future country singer Tom Wopat and future Smallville star John Schneider. It’s in the spirit of those kids’ memories that we wanted to check out Cooter’s Place, opened and owned by former actor Ben Jones, who played Cooter the town truck driver, a critical occupational need in a county where cars were getting demolished every other day in wild chases and freak ramp-jumping accidents. After the show ended, Jones served in U.S. Congress on behalf of Georgia’s 4th district from 1989 to 1993. (Fun random pop-culture trivia: serving next door in Georgia’s 5th district since 1987 is U.S. Representative John Lewis, portrayed by Stephan James in the movie Selma.) 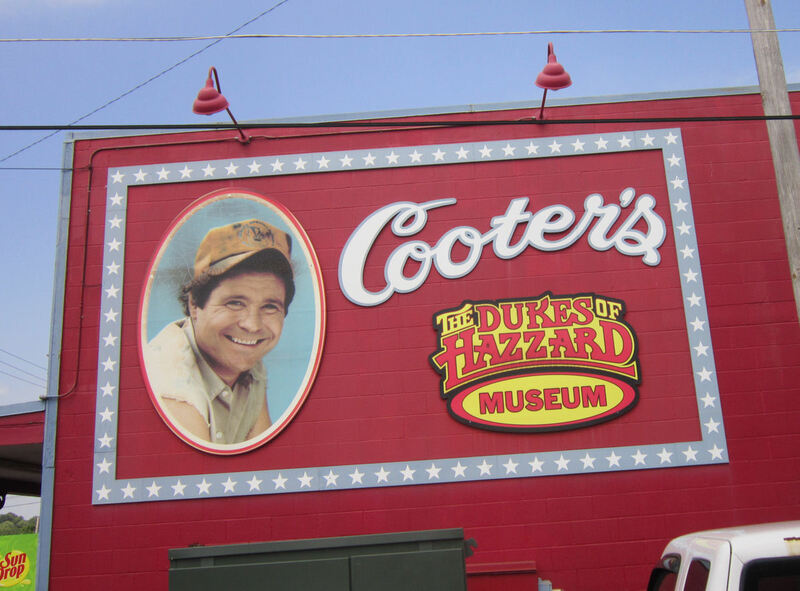 Today Jones owns three Cooter’s Place locations (others are in Gatlinburg and Sperryville), where fans of the show can relive the glory days of them Duke boys, the original Daisy Duke shorts, bumbling sheriffs, narrator Waylon Jennings, and more. You can also pick up copies of his new CD, a cover album called Southern Accents, just released this very week and available through the stores’ official site, autographed and for a reasonable price. 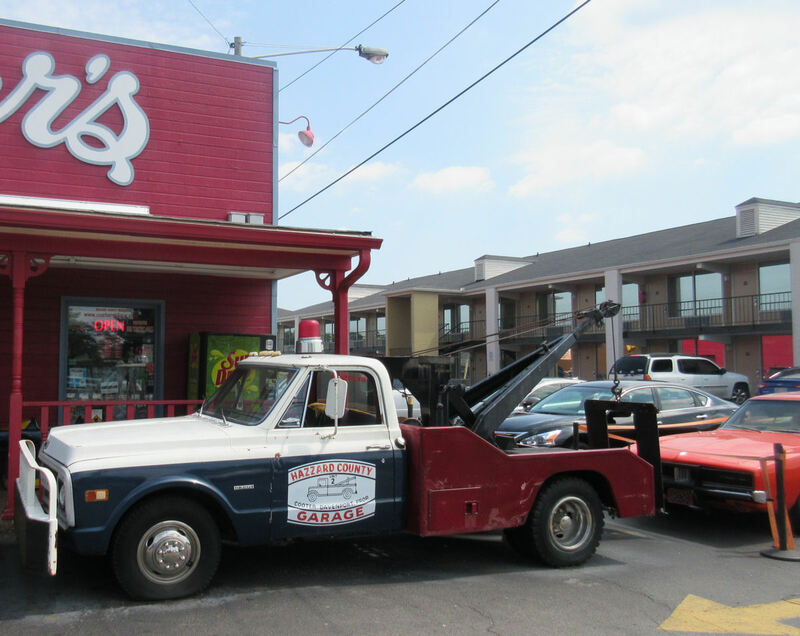 Out in front: Cooter’s original tow truck. 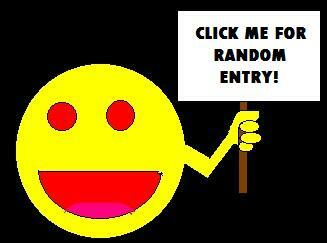 Visitors can have their photo taken in it for a fee. Or they can upgrade to a photo inside the General Lee. This isn’t the General Lee’s first appearance here on MCC (see also the first annual Indy Pop Con), but it was our first opportunity to sit inside one. Just like on the show, the doors don’t open and you could break your neck getting in and out if you’re not as limber as them Duke boys. The cars don’t stop there. 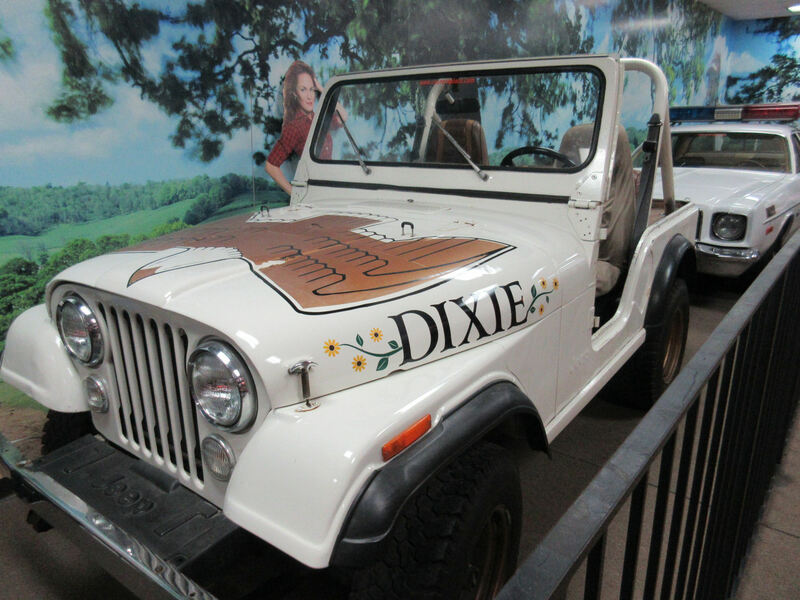 Inside Cooter’s Place, there’s also Daisy Duke’s jeep, as previously driven by actress Catherine Bach. Today she costars daily on The Young and the Restless, one of America’s last daytime soap operas. 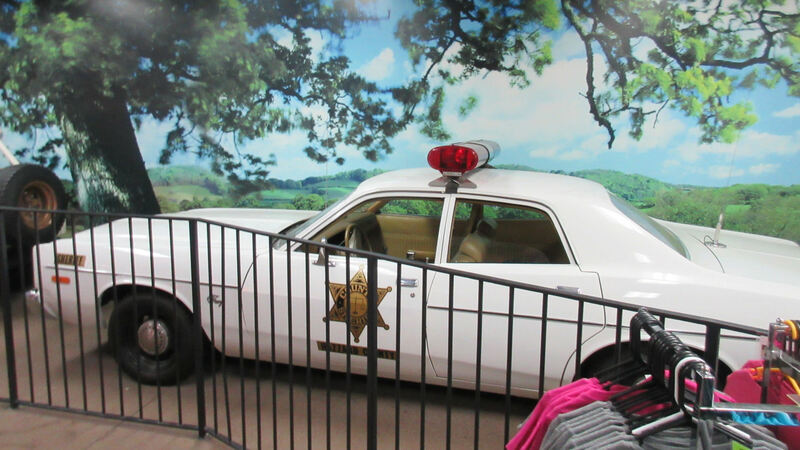 Behind the jeep is the patrol car once driven inexpertly by the weaselly Sheriff Rosco P. Coltrane. Actor James Best passed away three months before our visit, but receives special consideration from my wife because he appeared in three different episodes of The Twilight Zone. Anyone who ever appeared on the original Twilight Zone is an A-lister in my wife’s heart. 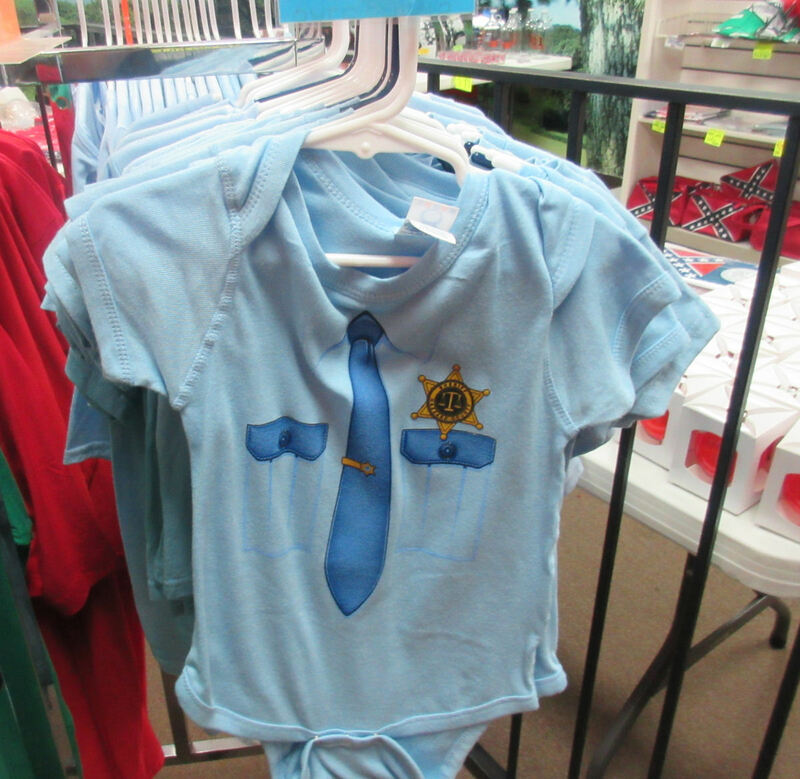 New mothers who loved his trademark annoying giggle might be interested in this Rosco P. Coltrane onesie for their wee tot who won’t get the show for a very, very long time. A full table is dedicated to the no-good name of Hazzard County commissioner Boss Hogg. Sorrell Booke sadly passed away in 1994, but his style sense has lived on in any number of white-suited villains. 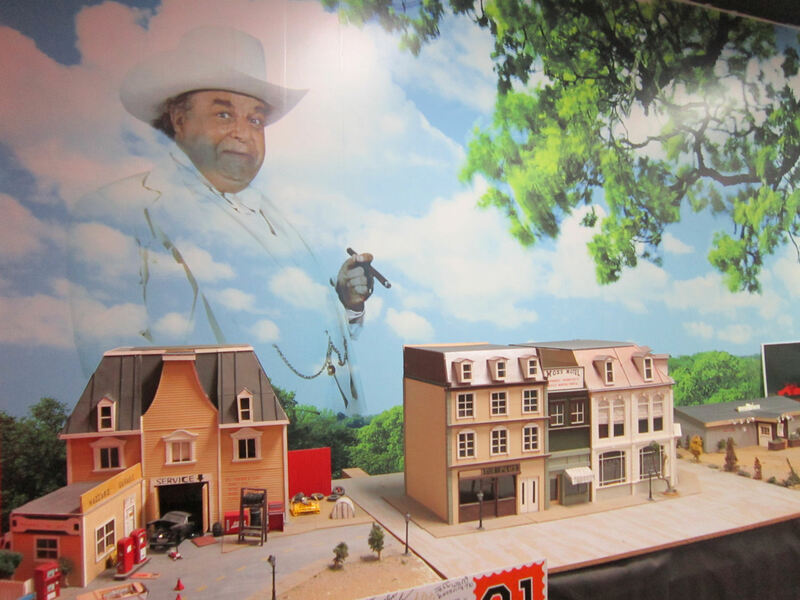 Imagine how many kids probably fought for the privilege of trick-or-treating in that Boss Hogg Halloween costume. 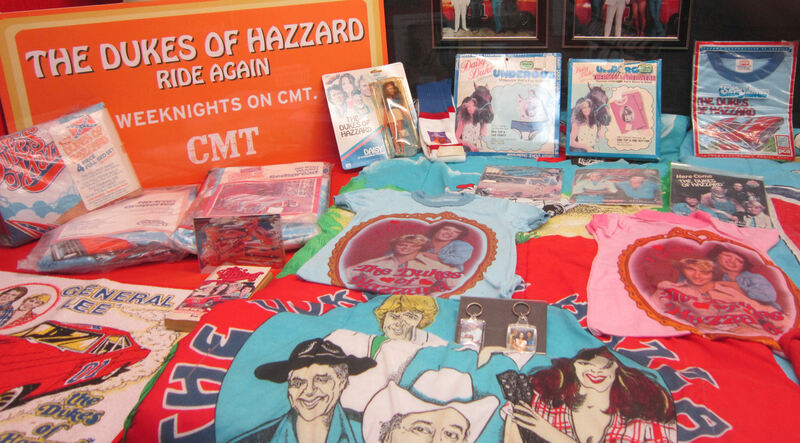 Shoppers can choose from hundreds of Dukes of Hazzard souvenirs, toys, DVDs (even the animated series! ), and so on. 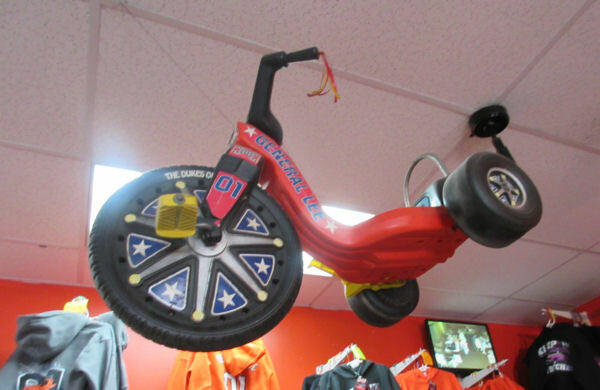 A few rare items are shown off for display purposes, such as this General Lee big wheel. Ramp-jumping lessons not included. Rider bears responsibility for all risks and injuries. 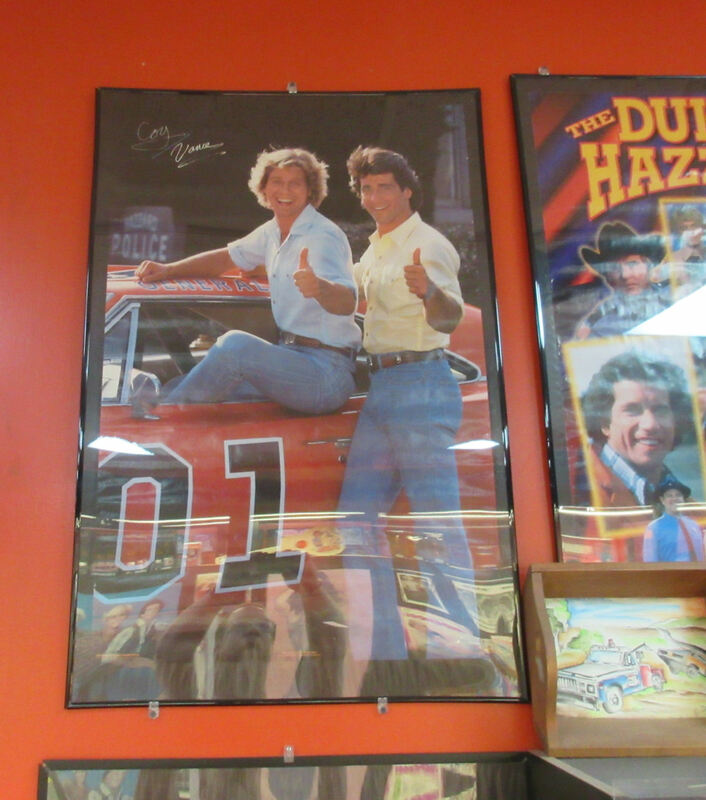 Think you’re the ultimate Dukes of Hazzard superfan? 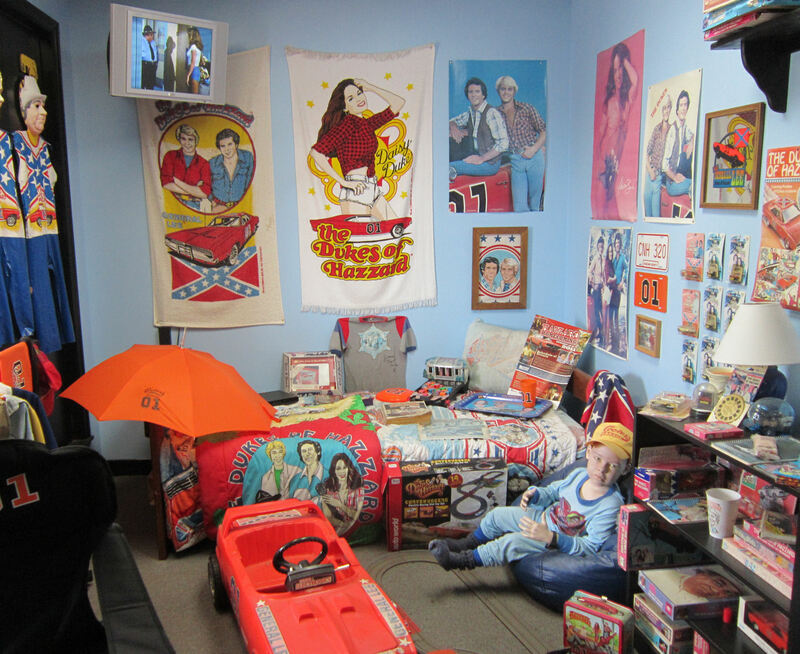 Then this is how your bedroom should look, covered in wall-to-wall Duke rebel flair. Anything less and you might as well walk away and go watch Portlandia instead. A thorough search of the grounds turned up exactly one item with the names of Coy and Vance, the Duke family scabs. For any reasonable fan of the show, that’s three Coy-and-Vance items too many. Chip Mayer, who played Vance Duke, had a small role in the Jim Carrey vehicle Liar, Liar before he passed away in 2011. Byron Cherry, who played Coy Duke, remains at large. One of the most valuable collectibles on site: the roof of the original filming General Lee, autographed by Tom Wopat. 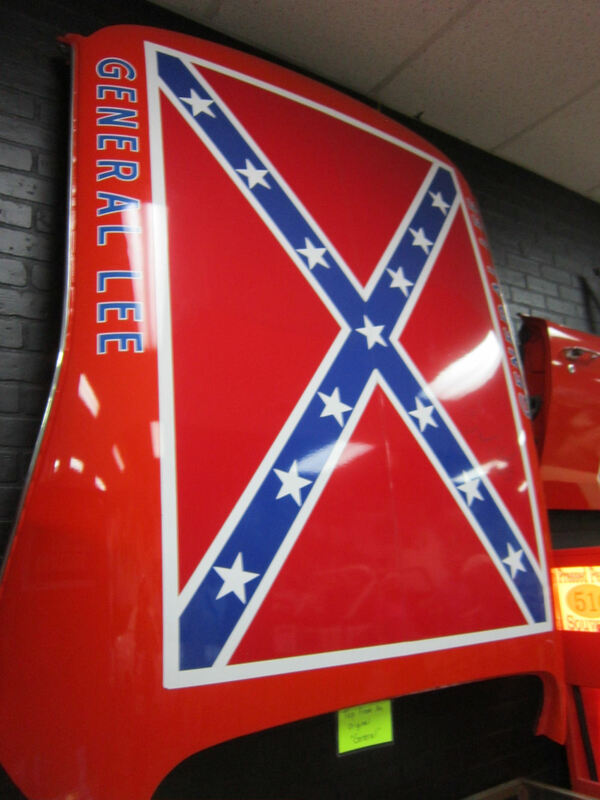 The Confederate flag that gave the General Lee its distinctive look flies proudly in Cooter’s Place. Cooter himself has gone on record as a staunch, unapologetic supporter of the flag and everything it’s meant to Southern white folk. Call it the “rebel flag”, the “Southern cross”, call it every name in the book — Ben Jones is a fan. A really, really big fan. 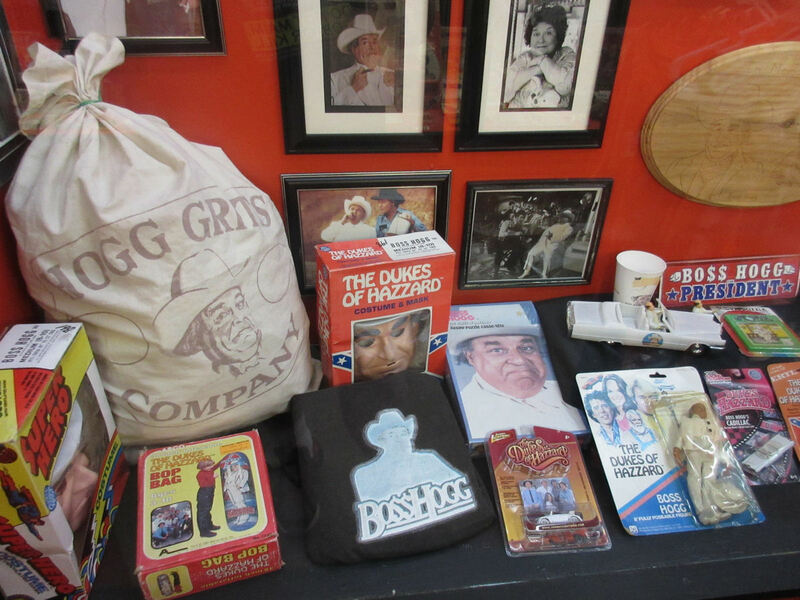 This section of the store was largely not for Dukes merchandise. A few odd Duke objects poked out here and there, but several displays contain things bearing that image and nothing but. 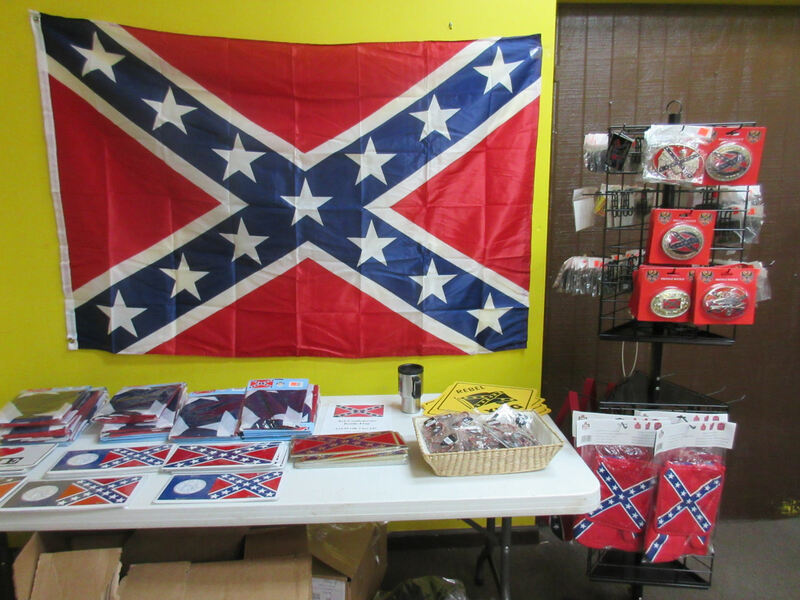 If you can’t make the drive out to Jefferson Davis’ Beauvoir, or if you want a wider selection of Confederacy knickknacks and household goods, Cooter’s Place has the room just for you. Plenty of “The South Will Rise Again” mini-flags so you can buy one for every family member and all wave them together on National South Re-Rising Day, should that come to pass before the endtimes. That part’s not what we came for. At all. Interested shoppers can stock up on more curios like these in his site’s “Shop Rebel” section while coming up with a story to tell their black friends about why they can’t get enough of this stuff. I like to imagine a day when they’re visited in a dream by the ghost of Boss Hogg dragging around Jacob Marley’s chains and wailing about how wrong he was about everything. And on that day, there’d come a reckonin’, and it wouldn’t do any good to tell him they’re making their way the only way they know how. I like to call it “A Confederate History Month Carol”. The Dukes bedroom mannequin child is freaky.